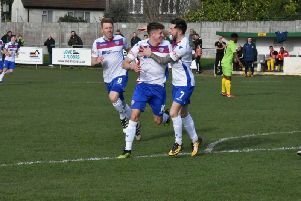 Two second-half goals helped send AFC Rushden & Diamonds into third place in the Evo-Stik League South Premier Division Central as they claimed a 2-0 win over Halesowen Town at Hayden Road. Diamonds were without skipper Liam Dolman due to injury with Blaize Punter being recalled to partner Jack Ashton at the heart of the defence. The hosts went close early on when Zack Reynolds’ 25-yard effort flew just over the bar. But it was Halesowen who created the better openings with Lewis Reilly twice off target when he was in a good position. However, it was Diamonds who broke the deadlock 10 minutes into the second half. The impressive Albie Hopkins cut in from the right and found Ben Farrell and his 20-yard shot found its way in with the aid of a deflection. And it was 2-0 10 minutes later. Hopkins was the creator again as he broke forward and passed to Tom Lorraine who fired into the bottom corner to double the advantage. Things were made slightly harder for the hosts when Ben Diamond was sent-off for a second bookable offence and Diamonds also lost Ashton to injury before the end as well. But they held on to move into third spot ahead of a big clash at fifth-placed Leiston on Saturday.